There is something we need to say right up front in this post, before taking a few steps back to explain in more detail. 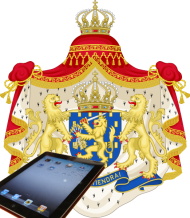 Contrary to what you may have read in many places elsewhere, Apple has not obtained an injunction from a Dutch court which is effective (formally or otherwise) across all of Europe. The injunction, based upon a patent in-force in the Netherlands, and deriving originally from a European patent application, is effective only in the Netherlands. However, as we shall see, this does not mean that the injunction is necessarily of little significance. For those who have not been following the story, in the past day or so, Apple has had a mixed result in a court in The Hague in its ongoing battles with Samsung. On the positive side (for Apple, not so much for Samsung) the Dutch court made a preliminary finding that Samsung’s Galaxy S, Galaxy S II and Ace smartphones infringe an Apple patent relating to a particular ‘photo gallery’ function, and issued a corresponding injunction barring Samsung from dealing with these accused products in the Netherlands. the injunction does not, in any event, go into effect until 13 October 2011, which provides Samsung with plenty of time to modify its products to remove the offending feature. Much of the above information is gleaned from posts on Florian Mueller’s FOSS Patents blog (see Dutch court orders formally Europe-wide preliminary injunction against Samsung Galaxy smartphones and Dutch judge considers Apple's slide-to-unlock patent trivial and likely invalid). At this stage, unfortunately, these posts appear to be the main source of information for the global media, largely because of Mueller’s high profile and his ability to translate the Dutch decision for the benefit of the English-speaking world. We say that this is unfortunate for two reasons. Firstly, we would be better served generally by the media if they would draw upon a range of sources, adopt a more critical approach, and seek to corroborate various claims made on blogs (this one included). Secondly, and more significantly, on this occasion Mueller has got something very wrong, and now this error is being replicated globally. As has been widely – and correctly – reported, the patent that has been successfully deployed by Apple is based upon European patent number EP 2059868, entitled ‘Portable Electronic Device for Photo Management’. According to the procedures established under the European Patent Convention (EPC) the application was originally filed centrally in the European Patent Office (EPO), where it was examined and ultimately granted as a European patent. to actually enforce the validated patent, the patentee must file suit in the appropriate national court, which can only issue orders enforceable in that particular country. There was, in fact, a brief period during the late 1990’s and early 200’s during which some national courts issued cross-border injunctions against patent infringers. However, in two cases decided in July 2006 (Case C-4/03, Gesellschaft für Antriebstechnik v Lamellen und Kupplungsbau Beteiligungs KG and Case C-539/03, Roche Nederland BV v Primus), the European Court of Justice held that European patents are national rights that must be enforced nationally, that it was "unavoidable" that infringements of the same European patent have to be litigated in each relevant national court, even if the lawsuit is against the same group of companies, and that cross-border injunctions are not available. There can thus be no question – the injunction issued by the Dutch court against Samsung is enforceable only in the Netherlands. If Apple wishes to obtain enforceable orders based upon its European patent in other countries in which it has been validated, then it will have to commence proceedings in the relevant national courts. It is common that the recipient of a European patent will choose to validate in only a handful of the 30+ countries that are members of the EPC, simply because it is expensive to register and maintain patents in a large number of countries, many of which may not be significant markets for the patented product. Often, these countries will include the wealthiest and most populous, e.g. the UK, France and Germany. This raises the question of why a company like Apple would single out the Netherlands as a country in which to validate – and specifically enforce – its European patents. Although the injunction will not come into force until 13 October, it could affect the UK as Samsung uses the Netherlands to import goods into Europe, and its Dutch subsidiaries will not be able to export the models to a number of European countries as a result. Rotterdam has the largest port in Europe, with the rivers Meuse and Rhine providing excellent access to the hinterland upstream reaching to Basel, Switzerland, and into France. In 2006, Rotterdam was the world's seventh largest container port in terms of Twenty-foot equivalent units (TEU) handled. The port's main activities are petrochemical industries and general cargo handling and transshipment. The harbour functions as an important transit point for bulk materials and between the European continent and overseas. While most people appreciate that a patent can be used to prevent the sale of infringing goods, there are in fact a wide variety of activities that constitute potential infringement. These include importing and exporting infringing products. Therefore, if you are the manufacturer of tangible products that are manufactured outside Europe, and must be shipped into the continent for distribution, you may be well-advised to ensure that any European patents covering the products are validated in the Netherlands. With Rotterdam being the largest port in Europe, the chances are good that any infringing products will enter and/or leave via the Netherlands, which provides a powerful single point of enforcement. So that’s why Apple has patents in the Netherlands. And why maybe you should, too! It looks to be a Korean outlet that has largely accepted Samsung's view of the world (unsurprisingly). But considering some of the uninformed reporting going around, it is more accurate than most! At least it is an alternative viewpoint, which is welcome. All anybody can do these days is try to inform themselves from a few different sources, and make up their own mind as to which is/are most persuasive. I expect the dust will settle a little in time. We will see what actually happens!